I remember when Faded Town came out in Ancient Origins some time ago, it was speculated to see some play against the Mega Evolution decks that had risen up in that time. Of course, the Stadium was only really good against those Mega decks, and with time it’s gotten a bit weaker. So what about a Stadium that extends the range but lowers the damage? 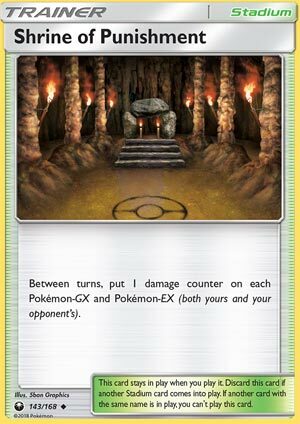 Shrine of Punishment is a Stadium card that says at any time between turns, put a damage counter on every Pokemon-EX and Pokemon-GX in play – both yours and your opponent’s. It’s basically a mix of Faded Town and the Poison Status Condition, where you put 10 damage on a Pokemon between turns, and it’s specifically tailored towards the big Pokemon-EX/GX. This is a tremendously powerful card, and as any player who’s played Hypnotoxic Laser will tell you, that 10 damage can mean a lot. Think of it this way: a Basic-EX/GX typically has around 170-180 HP, a Stage 1 GX has about 210-220, Megas can have anywhere from 220-230, and Stage 2 GX have almost 250 HP most of the time. Between turns is just whenever one player’s turn ends and the other player’s turn begins, so by the time your turn comes back around again, most of the time these Pokemon-EX/GX have taken 20 damage. That puts Basics on-par with most non-EX/GX Stage 2 Pokemon, Stage 1’s just a hair above Basics normally, Megas are just a little above that, and Stage 2 GX are now at the level of most Megas. Another pass of two turns puts them even lower, and the longer Shrine of Punishment stays in play, the more damage they accumulate. Now granted, you’re not likely to be KOing Pokemon-EX/GX solely off of Shrine of Punishment, but there’s another way of looking at this: your Pokemon can deal out a certain amount of damage, and Shrine of Punishment adds on more damage to each of their attacks against each EX/GX. In other words, you’re dealing an additional 20 damage against an EX/GX. That’s almost as good as another Choice Band! And without a means of getting rid of the Stadium or healing their own Pokemon, your opponent’s EX/GX are looking a little bit more frail than usual. Keep in mind this applies to your Pokemon-EX/GX too, so be careful when running this in a deck built around those – it could help your opponent just as much as it could help you. Arora Notealus: Shrine of Punishment is just the kind of card we need in a slower format to push for a little extra speed. It’s not overbearing or unfair, and it adds on those little bits of damage that ultimately help to chip away at the tremendously large health pools of big Pokemon, allowing for decks without as much HP to compete against those cards more readily. Side Note – in Magcargo’s review yesterday, I mentioned how we don’t really have a Rhydon-equivalent in Standard right now, completely forgetting about Sky Pillar that got released in this set. Sky Pillar is a Stadium that basically says the same thing as Rhydon’s Poke-Body, just applied to all Benched Pokemon in play, so spread damage continues to have counters to it. That being said, Guzma will still get around that and be the bigger problem to deal with. Next Time: The great Supporter of the set that brings you everything you want and more! Shrine of Punishments is on a similar proposition like Faded Town. While Faded town puts 2 damage counters on Mega Evolution between turns, Shrine of Punishments puts one damage counter on EX/GX Pokemon between turns. Obviously, it depends on what deck you’re facing because this Stadium can either be helpful against some and useless on others. Since the effect happens between turns, it is guaranteed to happen. And it’ll continue to happen until that Stadium card gets replaced. One damage counter may not seem much, but it invites certain power plays for both players, whether it be softening up for easier KOs against your opponent or scooping your own damaged EX/GX Pokémon with Acerola. The only reason not to run this is if you think that the deck that you’re about to face doesn’t use EX/GX Pokemon. Even then, you can use this to replace a Stadium card that is already in play. Shrine of Punishments is making GX cards unplayable. Don’t believe me? Send me an invite IGN PokeDeckCentral. I’m usually on from 9 PM to 11 or midnight EST. MarquisEXB posted a great decklist featuring Honchkrow and Shrine. You can find it at PokeDeckCentral. I am working on a version of it as well, I carry the new Psychic Promo Lele, but you could probably still use the Fairy one since you can just pop a Counter Energy down on it and watch your opponent hit the concede button. But I’d be more than happy to stomp your Zoroark GX, Buzzwole GX, Rayquaza GX or whatever other GX heavy deck you’d like. I will say that the only decks I lose to are non GX decks, but I’ve been watching a lot of videos about worlds this week. Of all the potential archetypes mentioned, are any of them non GX decklists? Maybe a little Greninja, a little bit of Xerneas Break Electrode GX, Yveltal Break Espeon EX. There was a quad Baby Buzzwole BKP Garbodor deck that made top cut at an ARG tournament two weekends back that ran a bunch of Shrines, so the meta has plenty of opportunity to figure out how torturous Shrine of Punishments actually is, but I believe that the overwhelming majority of decks at worlds this weekend will undoubtedly have GX Pokemon as their feature attackers and will carry a wide array of GX Pokemon as tech supporters. Therefore, there’s no doubt in my mind that a Shrines deck … no let me say this: multiple Shrines decks … will do well this weekend at worlds. That’s my prediction. Maybe they’ll be with the new Oricorio (CES 55 … can’t wait to hear an announcer on the live stream say “Zappy Pom Poms”), maybe with the Weaviles (Evil Admonition UPR and / or Rule of Evil BUS), Psychic Promo Lele, or maybe it’ll be with MarquisEXB’s Honchkrow build, but somebody’s going to run something with Shrines and clean up big. I know I have a long history of swinging and missing (Sableye GRI), and I am the crazy old bald(ing) guy who doesn’t like to run N in his decks, but I feel more strongly about Shrine than I did about Gardy winning worlds last year. Shrine of Punishments is a meta defining card. Three, five, ten years from now, we will look back at this card and say, “Wow remember when Shrine of Punishments first came out?” I’m running four copies in my decklists and a Lusamine to boot. And let’s give credit where credit is due here: I had Shrine as my 14th best card in the set. Most of my colleagues here on Pojo had it much higher than that. Clearly, like Dawn Wings Necrozma GX, they were a lot closer on this card’s value than I was. Were I able to re-do my list, this would definitely be my number 1 card now having played it for two weeks and seen what havoc it can wreak with my own two eyes. …which is relevant to Shrine of Punishment because of the glaring similarities. It may take some time for us to work out which decks could use Shrine of Punishments, which decks should use it, and – most importantly – which decks you should use Shrine of Punishment against. Like I said, the damage counter placement needs to shift the turn count, or like I haven’t yet said this review, trigger an effect or set up for some sort of combo. If it isn’t doing these things, it just functions as a generic Stadium, only useful for discarding your opponent’s Stadium or working with certain combos (like feeding Delinquent). I’m not trying to be dismissive of such things; that’s a useful feature! It is just a universal feature of all Stadium cards, so any other Stadium can do the same thing. Shrine of Punishment should be a big deal for Standard and Expanded, and you may as well run it if you pull it in the Limited Format. I had this as my personal 5th place pick, but don’t begrudge it being a bit higher.